With attractive daisy like flowers Rhodanthe species are becoming more popular in Australian gardens. It is the low growing cultivars that are most widely used and most of these are R. anthemoides hybrids. Also known as the ‘Paper Daisy’, these are a perennial plant that are frost and drought tolerant. Good pink to purple flower buds open to starry white flowers. These plants are an excellent choice for a rock garden, underplanting in containers or simply as a filler in the garden border. Rhodanthe are mainly found in NSW, Victoria and Western Australia, they are also often referred to as ‘Sunrays’ for example Rhodanthe anthemoides is often called the ‘Chamomile Sunray’, it has nice foliage and white papery flowers. Related to the Asteraceae group they have daisy like flowers that show from winter through to spring. Generally low growing to .2metres and spreading to around 60 cm. Rhodanthe anthemoides prefer a well drained soil and a sunny position. They make good container plants and are readily available at good nurseries. Prune lightly after flowering to promote a good bushy habit. R. chlorocephala ssp rosea is the ‘Rosey Sunray’ and R. chlorocephala comes in a range of colors and comes well from seed, sow seed in early spring in an open sandy potting mix. The annual R. chlorocephala with their rosy pink flowers could be even more popular. R. manglesii is the ‘Pink sunray’. 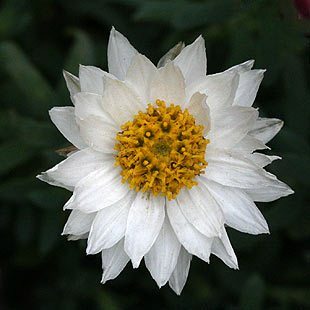 Named varieties such as R. anthemoides ‘Paper Baby’ and R. anthemoides ‘Paper Star’ and the very attractive ‘Southern Star’, are now appearing in nurseries.